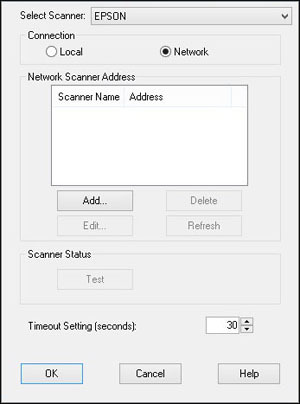 Windows 8.x: Navigate to the Apps screen, then select EPSON Scan Settings. Windows (other versions): Click Start or and select Programs or All Programs. Select EPSON Scan > EPSON Scan Settings (or EPSON, then EPSON Scan, and then EPSON Scan Settings). OS X: Open Applications > Epson software, then double-click EPSON Scan Settings. If you see a EPSON Scan cannot be started window, click No. The window may appear twice. 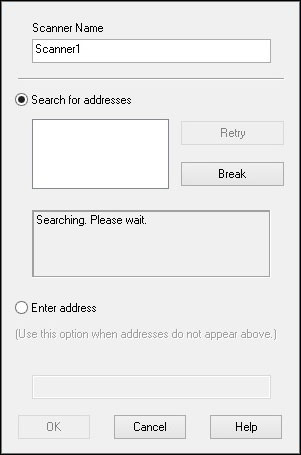 Note: If you have a firewall or Internet security software installed, the search feature may not work correctly. In this case, click Enter address and enter the IP address manually. Windows 8.x: Open File Explorer (navigate to the Apps screen, then select File Explorer). Windows 7 or Windows Vista: Open Windows Explorer (right-click , then select Explore or Open Windows Explorer). Note: If you have third-party software installed in the twain_32 folder, you may need to reinstall the software. Windows XP or OS X: Uninstall and reinstall the Epson Scan software.